Related Web Page link isn't visible except on desktop. Users of apps and mobile versions of the site (phone/tablet) don't see it. I noticed that the coordinate verification thing for waypoints is a bit too unforgiving. The detected problem in 2 above is a missing space between "N" and "59"
The detected problem in 3 is a decimal comma instead of decimal dot. In none of these cases the website tells the user what the problem is. Either you get a "Please enter valid coordinates." or "Please enter latitude and longitude values in DDM format only.". What does DDM even mean? An example of correctly formatted coordinates would be more helpful. Why not use the same verification rules as the "corrected coordinates" field uses? It seems more forgiving and at least can parse the number 2 version above. Yep I tend to have at least 2 tabs open so a refresh is all that's needed rather than back and forth navigation. Now that waypoints and attributes are on the same page that's really only 2 tabs I'd have open (edit+preview). A Team has already spoken to this, but I'll repeat, the CSP has not had a related web page field for years. It WAS on the edit page. Now it's not. Most devices don't show it. Those puzzles that rely on it will need to careful ! Maybe that is the primary reason? When I created my first Wherigo, I used the Related Web Page to link to the cartridge on Wherigo.com, and nowhere else. Later I got feedback from app users that it was easier for them if I had a link in the description itself, so I added that. True but only once when you start editing. Now this checkbox resets every time you click save. Before it remained checked. Before I checked two boxes once, now I must check one box about one hundred times.It is big difference. Yep, for wherigos I got used to loading the cache web listing in order to go right to the Wherigo. But I found more often recently that people linked to the cartridge in the description, which is nicer. Consider though - the related web page is still a viable puzzle style IF it's available. It's quite similar to using the background image for the listing. Apps can't access them directly necessarily. It requires a browser that can isolate that background image (via page loading or source code, etc). Basically, if a piece of the listing data can contain a puzzle element, it's fair game. So agreed, caches that use the related web page field should be careful not to clear the field accidentally, or the puzzle can't be recreated in the same manner; no getting that field back once it's cleared (unlike the background image). I created a cache page before this change was made, but didn't submit it for review until after the change. I know that I had updated the final coordinates (it's a puzzle) and added attributes before submitting the cache for review. But today I saw the final coordinates were incorrect and now there's no attributes selected. Ok, I see. Completely different understanding of ratings Over here we simply like to differentiate the difficulty of a T5 cache compared to others. Noone here would rate my cache a D1/T5. Never ever A D1/T5 would be a cache hanging in a tree at about 4m where you only need to use a ladder. And some people here even don't rate this kind of cache a T5 at all as they say, a ladder isn't exactly a that special tool at all. I don't care that I'm doing wrong as this probably is the common understanding of rating over here. And regarding the steak... I just booked my flight some hours ago! Will be in Seattle 1st weekend of March (Fr-Mo)! No worries. Just think about wheel chair users who cache on their own. Wouldn't make sense to set that attribute then, would it? The stroller attribute might already show them they can at least join others but might not necessarily be able to get the cache by themselves. I'd assume that a search for caches findable by a wheelchair bound user would be retrieved by searching with the attribute and T1 (maybe 1.5) and no more. I might add a second layer of higher T caches with the attribute in just those cases that maybe it's just a looooong hike to get there on a relatively smooth trail, and the cache is still retrievable by wheelchair; but it could also include caches that are up in a tree next to a park sidewalk for which I'd ask a friend to come. There are various interpretations of this, and the fact that the attribute can be applied to higher T directly implies that wheelchair-accessible doesn't always mean "cache is retrievable from a wheelchair". I also already was requesting a change here as I still believe this is complete nonsense (sorry that for ), BUT the official decision made was that this simply is as it should be! Final answer regarding that came from Frau Potter. Sorry, but this already has been answered by a lackey in this thread as far as I remember and the answer was: Wheelchair icon CLEARLY says that the cacher don't need any help to grab the cache in the end. Sure, that may be the intent, but how can a reviewer guarantee that a T4.5 cache with the wheelchair attribute is accurate to that intent? The reviewer could require that the T be dropped to 1 if it's accessible by wheelchair, but the allowable listing structure doesn't restrict that. We do know it technically can because other similar restrictions are in place; but you can add the attribute on high terrains. Essentially, the reviewer would have to trust that the CO is truthful if they say for example "the cache is accessible by wheelchair but the T is rated for the very long hike/travel to get to gz from the trailhead". The reviewer would either publish that, or require the lower terrain rating. In either case, as a finder, I can't be sure that a search for wheelchair attribute means I'm guaranteed to be able to retrieve it, or that the such a search would give me all caches I could retrieve by wheelchair. In short, because higher T caches can have the wheelchair attribute, it's an honour system flag that if the wheelchair attribute is enabled that it's traversible and retrievable by wheelchair. If I wanted caches I know I should be able to find and log alone, I'd really only be certain if I searched for both the attribute and the low T.
ETA: Concession - Yes, I'll admit and agree that it is reasonable for a reviewer to require in their review process that if a cache has the wheelchair attribute on it that the CO must demonstrate how it is indeed retrievable by wheelchair (unlike the stroller accessible attribute which doesn't imply the cache itself is retrievable with stroller in hand, or by a child in a stroller ). If this is a rule that every reviewer must enforce, then the point is moot - the very definition of the attribute would be that the cache is retrievable by wheelchair, regardless of T rating. The complement to that as we know is that a T rating of 1 must have the wheelchair attribute. Concession: Yes, I'll admit and agree that it is reasonable for a reviewer to require in their review process that if a cache has the wheelchair attribute on it that the CO must demonstrate how it is indeed retrievable by wheelchair (unlike the stroller accessible attribute which doesn't imply the cache itself is retrievable with stroller in hand, or by a child in a stroller ). If this is a rule that every reviewer must enforce, then the point is moot - the very definition of the attribute would be that the cache is retrievable by wheelchair, regardless of T rating. The complement to that as we know is that a T rating of 1 must have the wheelchair attribute. Heck I'd hope that there would by higher T caches with the attribute, as there might be days I might feel challenged to give one a go (not speaking as a wheelchair user, obv, and presuming such a definition of the attribute that any flagged cache is retrievable by wheelchair). Sort of like... just as if I'm chair-bound and I might save the highT+wheelchair for a challenge, I might save scuba gear required, or boat required for the days I'm up for the 'challenge' of retrieving it with that required tool. But how strict will the input be? Points 2 and 3 are minor variations where the coordinate format is easily gleaned from the input string. Okay, granted but what if "reach" and "return" might require the usage of one of those grabber things for a person in a wheelchair? A TOTT, but only for those who can't reach a book 6 ft up on a shelf? Would the wheelchair attribute/ T1 be allowed if one notes that such a TOTT might be required for those in a wheelchair? This sounds like a bug! Could you let me know which cache you are having the issue with? A GC code or URL would be great. Thanks! Please note my newly published event is a North Island, New Zealand event, but the only way I could save changes to the cache listing under the fancy new cache edit page was to change the location to somewhere in USA. So I’ve made my changes as an American cache, and now can’t change it back to NZ NI. Fortunately the cache title says the event is being held in Hawke’s Bay, although apparently that’s in AL USA. I posted an Announcement to remove doubt. Please note my newly published event is a North Island, New Zealand event, but the only way I could save changes to the cache listing under the fancy new cache edit page was to change the location to somewhere in USA. Too bad there isn't a "go back to the old page" link on the new edit page. The physical effort of following the directions is terrain, but the mental effort of understanding the directions is difficulty. At least, in my mind. Which is why I have no trouble taking this example and imagining a D3 event. The description presented here strikes me as non-trivial to follow before considering the physical effort. But I'm not allowed to have a D3 event. What I'm unsure of is whether I would be allowed to have an event at this location as long as I didn't rate it D3, or I'm just plain not allowed to have an event at this location because it's too hard to figure out how to get there. In other words, do events actually have to be easy, or is just that I'm not allowed to say an event is hard even when I think it is? along with the link to the Help Center update, the input will not be case sensitive and we'll be more forgiving with spaces too! We've been working on a fix for this bug and we'll have the update in production in the next few hours! The issue was a data anomaly in NZ - thanks for reporting the issue here. Yeah, I wasn't 100% certain about that aspect of monsterbox's example. Ultimately, I interpreted "It was absolutely clear where the box is" as meaning that there was no mental challenge to figuring out where to go, that at each point along the way, it was "absolutely clear" where you needed to go next. The challenge was just in completing what is essentially an obstacle course. And then once you reached GZ, "It was absolutely clear where the box is." I have found caches where a big part of the challenge is figuring out a safe, legal route to GZ. The walk itself was easy (T1 or T1.5), but it wasn't obvious where to walk. In that case, I think the challenge of figuring out the route contributes to the difficulty rating, like solving a puzzle to get the coordinates. In my view, this is a complete abuse of the D/T system. If finding the way to GZ and the cache there is both trivial, it should be a D1. If actually following the path to GZ is a hard physical challenge, it's T5 - but still D1. A different issue would be a multi-cache, where finding the way to the final (e.g. through a maze of tunnels in an old bunker system) is difficult in itself, so I agree that your original example is not D1. But using the D-rating to further differentiate between "easy" and "extra hard" T5 caches doesn't make sense. A big orange box in a tree is always D1, even if it's very high up and you need a complicated setup to reach it. Wow! Thanks for making me aware of this. That change is a bad idea. I have one puzzle, where I got an exemption from the 2-miles-rule from the reviewer, because the design of the puzzle depends on a specific listing coordinate. So now I wouldn't be able to make the slightest change to my cache page. Well, my listing was rather old, the puzzle a bit "dated", and I had played with the idea of archiving it anyway. So that's what I did now . The button to "Add waypoint" turns green when I mouse over it (cursor not shown in my screenshot) but clicking on it does nothing, whether I use Safari or Chrome. I don't see an option to opt-out of the new features until they work. Is there another way to add or enter waypoints? Agreement. For all the GeoTours and geo-series I create / manage, we use the Short Description for the series text and the Long Description for the cache specifics. Easy and clean way to delineate the two. Melding the two in one field will require more effort going forward, esp. when I'm working with multiple cache owners who have varying skill levels with cache writeups and HTML. It was much easier and more understandable to say "Paste this [provided template text] into the Short Description, and don't add anything else. Use the Long Description for your cache specifics." Suspect I'll be doing a lot more back and forth to get pages done correctly for series. Sigh. I still think an example of the correct format in the error message would be more helpful than just a link to the help center. But why chose one when you can have both? "Please enter latitude and longitude values in HDD MM.mmm format. Read more here"
It was much easier and more understandable to say "Paste this [provided template text] into the Short Description, and don't add anything else. 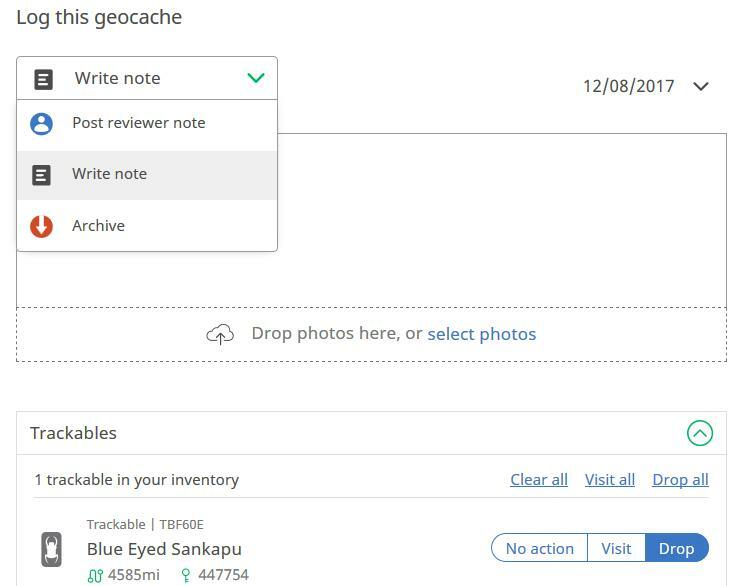 "First paste this [provided template text] into the Description, and then write what you want after it"
If you have trackable inventory, you can drop a TB with a Reviewer Note on your unpublished cache. I just did it. Please, let me know which of following steps are not working for you. 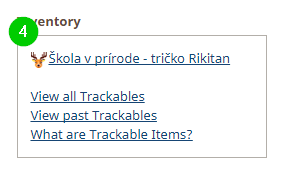 I successfully dropped TB to one of my unpublished testing cache pages. Apart from first step the same process like before. I noticed that the new form now displays the final coordinates as the posted coordinates when the CO is looking. When the cache is published the correct posted coordinates are displayed. Was that intentional? Thank you for reporting this issue! Could you let me know which cache you are looking at and which browser versions you are using so that we can try to reproduce the issues on our end? Much appreciated, we'll do our best to get this resolved quickly. I could change the posted coordinates to within 2 miles of the final, and add an additional waypoint for reference but this would draw more attention to the location and the hint to the puzzle becomes less subtle. Some may say this is a good thing(! ), but I'm not happy that I'm forced to rework my puzzle when nothing has actually changed. LivingInNarnia, is it going to be possible to bypass this validation if neither posted nor final coordinates have changed? It's a depressing shift in attitude, from flexible to rigid. From judgement calls by cachers & reviewers to rules enforced by code. 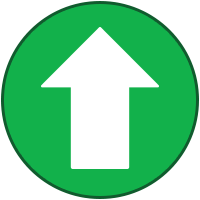 We had a lot of conversations with the volunteer reviewer community and the community about these changes. The 2 mile rule for mysteries has been in place for some time and the volunteer reviewers have had the task of reminding COs to follow the guidelines. 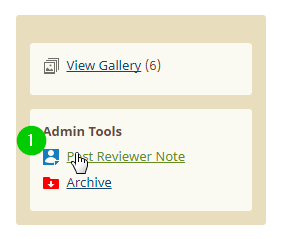 Now that Geocaching HQ enforces the 2 mile rule on the Edit Page, the volunteer reviewers have fewer errors to chase after and to ask the cache owner to update. I think a lot of us thought the 2-mile clause was a guideline, not a rule, and would therefore allow some leeway on the part of the reviewers. It's interesting to hear that it's now considered a hard rule. Maybe that should be mentioned in the hiding guidelines (/rules?). What you said above makes perfect sense for new caches (if it's indeed now a rule), and I have no problem with that. Anything that makes the reviewers' lives easier is usually a good thing. However, the removal of grandfathering for existing caches is what's concerning to us. If the owner of such a cache needs to make a minor change to their listing, they're now forced to bring it into compliance with the more recent guideline/rule? If the cache depends on the original coordinates (as is the case for some older puzzles), this could lead to a cache needing to be archived simply because a minor change needed to be made somewhere on the listing. I expect this decision was probably made in order to avoid the need to code exceptions into the page, but it would seem fairly straightforward (from the outside) to check if the coordinates or final waypoint have changed, and if they haven't, then allow other changes. This would be similar to the way you're treating the Related Web Page field. 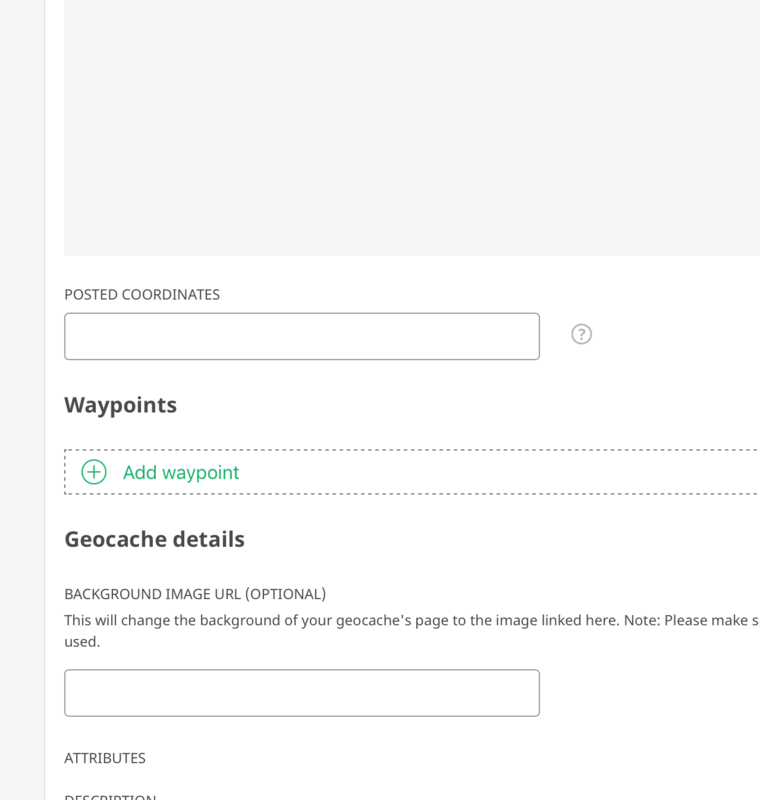 Alas I can no longer upload images to the cache page during design phase. This is crtical for some puzzle caches and often used for numerous other cache types, especially events. Also, while designing the cache page the save and edit is way more important than the submit for review, especially if the cache is more than simple text. Please emphasize the save options at least as much as the review button. Lastly, tooltips (alternate text) on the attributes please! 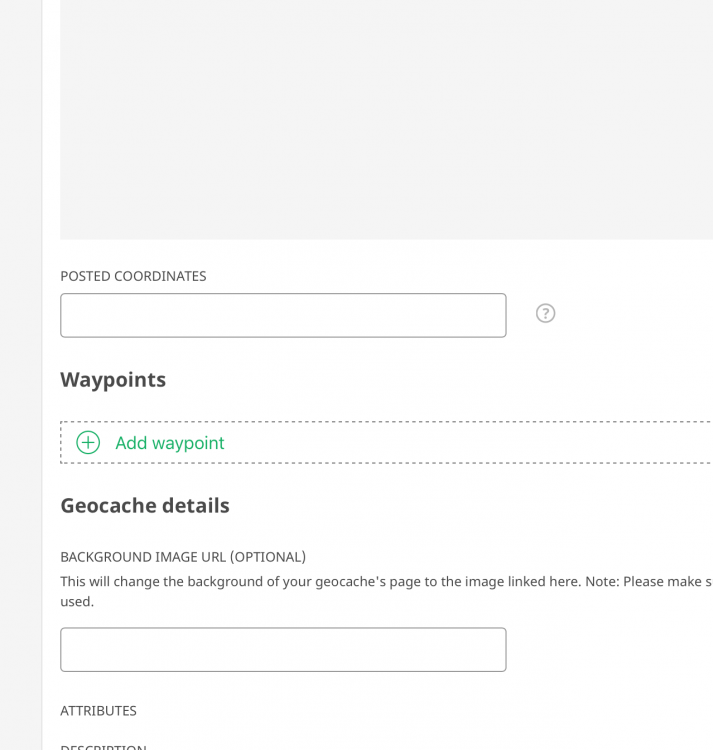 However in general I love the the new cache design page. Having way points and attributes and on;ly one description field is wonderful. Many thanks!